Master micro controller board with twelve 0-5vdc sensor inputs, four 5vdc digital inputs, ten 230vac 6.3amp relay outputs, four 0-10vdc analog outputs, MCS-I/O, RS-232, RS-485, and Ethernet communication ports. Description Magnum-12 with 7" 262,000 colors 1280x800 resolution touchscreen, NEMA4 rated. Description Magnum-12 with 10.1" 16.2 million colors 1280x800 high resolution touchscreen, NEMA4 rated. Description Magnum-12 with 15.4" 16.2 million colors 1280x800 high resolution touchscreen, NEMA4 rated. Description Magnum-12 with Door mounted waterproof Keypad / LCD assembly. Expansion board for a MCS-MAGNUM-12 is the MCS-IO-BASE with sixteen 0-5vdc sensors inputs, ten 230vac 5amp relays outputs, and four 0-10vdc analog outputs that can be expanded to thirty-two 0-5vdc sensors inputs, twenty 230vac 5amp relays outputs, and eight 0-10vdc analog outputs by pairing with the -EXT Board within the footprint of the -BASE board. Description MCS-IO-BASE/-EXT(Board only), mounts with six #6 sheet metal screws. Expansion board for use with an MCS-MAGNUM-12 is the MCS-SI-BASE with sixteen 0-5vdc sensors inputs, and four 0-10vdc analog outputs that can be expanded to thirty-two 0-5vdc sensors inputs, and eight 0-10vdc analog outputs by pairing with the -EXT Board within the footprint of the -BASE board. Description MCS-SI-BASE/-EXT (Board only), mounts with four #6 sheet metal screws. 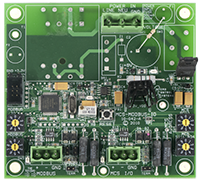 Expansion board for a MCS-MAGNUM-12 is the MCS-RO-BASE with ten 230vac 5amp relays outputs that can be expanded to twenty 230vac 5amp relays outputs by pairing with the -EXT Board within the footprint of the -BASE board. Description MCS-RO-BASE/-EXT (Board only), mounts with four #6 sheet metal screws and comes with a Lexan cover. Description MCS-MODBUS-IO-12, mounts with four #6 sheet metal screws through nylon collars at corners of board. The MCS-MODBUS-IO-12 gives the MCS-MAGNUM-12 the ability to act as a Modbus Master using the Modbus RTU Protocol. This allows the MCS-MAGNUM-12 to communicate to Modbus slave devices (such as Variable Frequency Drives, Compressors, etc.) to send and access parameters. The MCS-MODBUS-IO-12 performs like an MCS-RO10 and MCS-SI16-AO4 to the MCS-MAGNUM-12. This allows the MCS-MAGNUM-12 to control 10 relays, 4 analog outputs and read 16 sensors inputs. Multiple MCS-MODBUS-IO-12 boards may be connected to the MCS-MAGNUM-12 following the MCS-I/O standards. Description MCS-12V-50W/-75W/-100W is used to power MCS 12V products including the MCS-MAGNUM-N-12, 12V Expansion boards, and the MCS-TOUCHSCREENS.